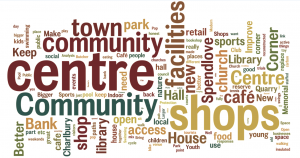 We have been collecting views and suggestions on all aspects of life in Charlbury. What will happen to all this feedback? We will be analyzing all of the feedback we have received and organizing it into themes – this will inform the working groups on community, infrastructure and movement and feed into the first draft of the strategic plan. All information will be made available here and comments which are about a specific place will be recorded on an interactive map. Please keep an eye on the discussion forum over at www.charlbury.info where we will post updates. 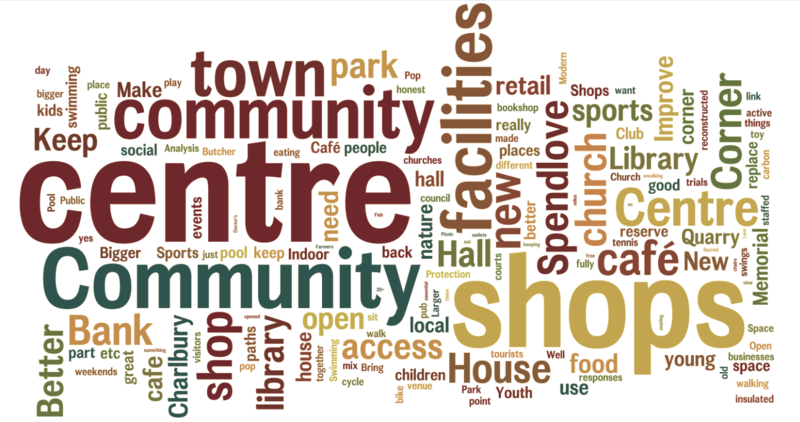 The word clouds below give a quick impression of the most important issues that have come up in feedback to the group so far. The size of the word indicates how often it was mentioned. As a long-term resident of Pooles Lane, I can say without doubt that the absolutely worst thing that could happen to it would be to make it a one-way lane. The only thing that slows speeders down is the fact that they have to give way to each other at the narrowest point, which is outside my house. I’d hazard a guess that the majority of residents here would not want a one-way lane. The danger to the pedestrians, who have no choice but to walk on the road itself, would increase enormously if there was no deterrent against the fast drivers who use this lane as a rat-run. There are very small children in this immediate area who are already at a higher risk of being involved in an accident, what with the massively increased usage of the road, for example, by literally tons of traffic that is directed along here by satnavs; local trades with vans, trucks and trailers who use this as a shortcut through the town, and the many customers of the co-op who drive through the town to get there. As I sit here right now, I can hear and see traffic roaring past, brakes being applied, horns being pipped, just a lot of noise. It’s unnecessary, invasive, and potentially dangerous as drivers get more and more frustrated with each other and speed up to get to the end of the lane before they have to slow down and pull in to make way for someone bigger! I have not even mentioned the daily presence of large delivery vans from the shops and supermarkets, as this affects every road, but it is another element that adds more danger. If this area is to be made safer, then all this extraneous traffic needs simply to not come down the lane. The name says it all, it’s a lane.